Grab your costumes and head to Great Wolf Lodge Georgia for some fun Halloween themed activities during Howl-O-Ween! We visited Great Wolf Lodge Georgia this past weekend to check out all the great Halloween fun they have to offer. The grand lobby is filled to the brim with decorations and a not-so-scary haunted house that serves as the first stop on the Trick-or-Treat trail. There are loads of pumpkins and themed areas that the kids will love. 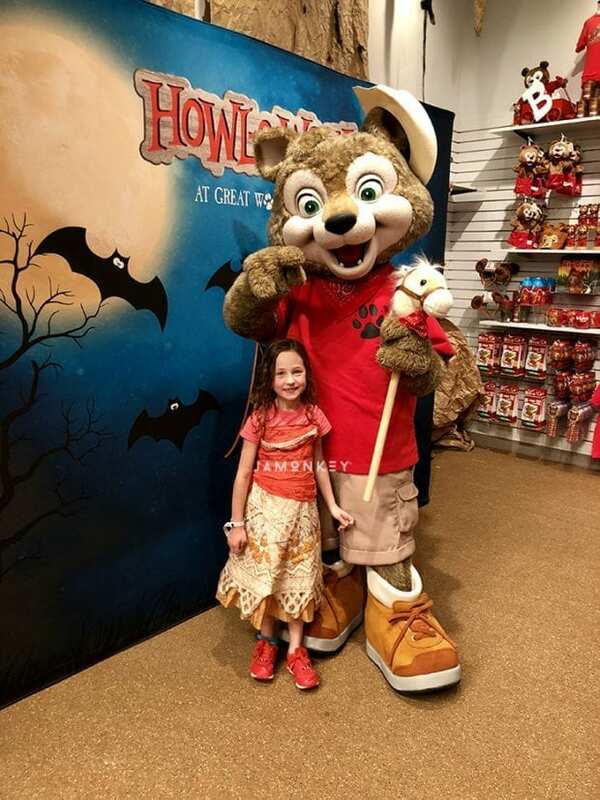 Character Meet and Greets – The Great Wolf Kids all have their own fun costumes to share. Make sure to stop by Camp H.O.W.L. to see the schedule of when you can see them. Howl-O-Ween Wolf Ears – During Howl-O-Ween you can grab a special pair of orange ears! Spooky Games – There are a few times a day that fun games happen in the Grand Lobby with trivia, giant games, and a BOO Bingo. Halloween Crafting Projects – Crafting activities get spooky with different options each day. We made Howl-o-ween themed buttons, but there are also pumpkin themed crafts. 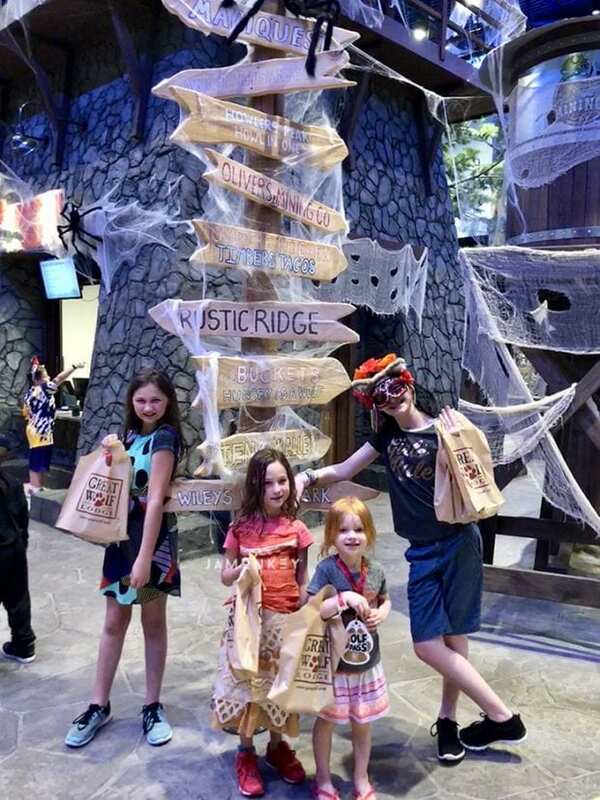 Trick-or-Treat Trail – One of the coolest aspects of Howl-O-Ween is being able to Trick-or-Treat in Great Wolf Lodge. 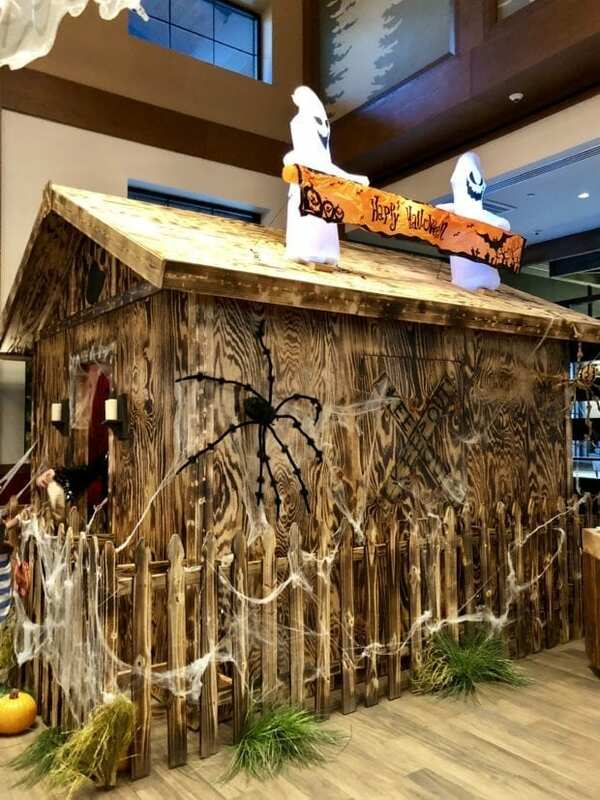 There are multiple trail stops around the Lodge where the kids got to collect candy and participate in an interactive activity such as the Witch Hat Ring Toss, Mummy Bowling, Pin the Wolf Ears on Mr. Bones, and more. Costume Parade – Guests will put their boo-tiful costumes on display and join the Great Wolf Kids for a Costume Parade around the Grand Lobby. The characters have their own fun costumes to share as well. Monster Bash Dance Party – This was our favorite thing of the evening. Dressed in our costume, we have the perfect dance party. This is normally the pajama party before bed, but the costumes add some special flair! Spooktacular Story Time – Before you end the night head to the Grand Lobby for a good night story with a Howl-O-Ween twist. You'll hear a festive Halloween story before climbing into bed. The interactive tales will transport guests into a boo-bit scary, but mostly silly land every night. 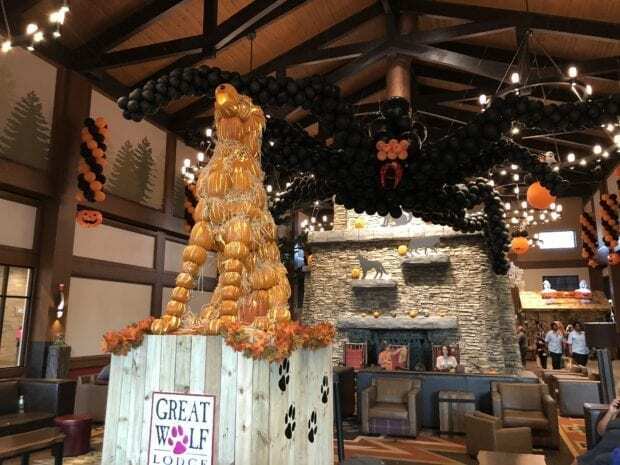 Plan a day trip or stay the weekend and enjoy these fun Halloween themed activities at Great Wolf Lodge during the month of October! Great Wolf Lodge loves to celebrate Howlidays and Birthdays, check out all the fun you can have year round.